Temples are places dedicated to the worship of Buddha. They also served as places where monks and nuns lived, trained and studied. Lay worshippers also gather at temples and separate buildings exist for each area of temple life. The layout varies from temple to temple but there are seven main buildings: the to (pagoda), the kondo or hondo (main hall), the kodo (lecture hall), the shoro (bell tower), the kyozo (sutra depository), the sobo (dormitory) and the jikido (dining hall). The pagodas were traditionally considered the most important and placed in the center of the compound as they were believed to enshrine pieces of Buddha's remains. Architectural changes over the centuries show that this importance declined. The compounds are surrounded by earthen walls with gates on each side. The gates are often of great importance and architectural beauty. While various sects have other important buildings, depending on their particular beliefs, Zen temples are more radically different. Layout, building names and structural features are different and zen temples typically include a carefully designed garden. This zen garden has become one of the most widely known aspects of Buddhist temples. The karesansui (dry mountain stream) gardens, unique to Japan, use sand, gravel, stones and rocks to represent land and seascapes. The sand or gravel are carefully raked to create the impression of water flowing and stones and rocks are used to create mountains and islands. The overall impression is that of a universe in miniature. The most important and impressive temples are located in and around Kyoto and Nara. Around Tokyo, both Nikko and Kamakura have temples worth visiting. Most have an admission fee of 200-500 yen, sometimes with additional charges for gardens or museums within the compound. The Phoenix Hall at Byodoin in Uji, near Kyoto. The temple was converted from a villa by the Fujiwara family in 1052 and the hall built the following year. The phoenix was a mythical bird believed to be a protector of Buddha. The hall is featured on the 10-yen coin. The earliest temples date to shortly after the introduction of Buddhism from Korea and China in the mid-6th century. The first temple was the converted home of the powerful Soga family in 552. They also founded Asukadera, the first official temple complex (or monastery), south of modern-day Nara in 588. Prince Shotoku, considered the father of Japanese Buddhism, is said to have built the Seven Great Temples of Nara at the beginning of the 7th century. 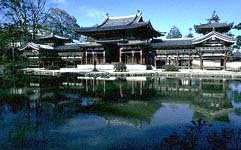 These include Horyuji, whose main hall is the oldest wooden building in the world. In the mid-8th century, under instructions from emperor Shomu, kokubunji (provincial temples) were built in each province, with the head temple being Todaiji in modern-day Nara. The honzon, or main object of worship, at Todaiji is a 15m high gilt-bronze statue of Buddha, known as the Nara Daibutsu (Great Buddha of Nara). By the end of the century there were about 360 temples throughout the country. The Heian Period (794-1185) saw the emergence first of the Tendai and Shingon sects and later the Jodo (Pure Land) sect of Buddhism. Each sect established its own temples, with the Jodo sect building many halls to enshrine the Buddha Amida. The amidado (Amida Hall), built in 1053, at Byodoin temple at Uji near Kyoto is one of the finest surviving examples of architecture from this period. It is popularly known as the ho-odo (Phoenix Hall) because of its symmetrical wings and the bronze birds that sit on its roof. In medieval Japan, the military leadership patronized the Zen monasteries while the older sects established monzeki - temples headed by members of the imperial family. Later, as the number of sects increased, the Jodo, Zen and Nichiren sects became particularly popular among the common people. Under the Tokugawa Shogunate, a system was established whereby all citizens had to register with a local temple. This system and other controls continued until the Meiji Period (1868-1912), when Shinto was officially separated from Buddhism and established as the state religion. Budhism and the temples fell into a period of decline, with many temple lands being confiscated. Freedom of religious faith was reintroduced in the post-war constitution but the Buddhist temples have had to compete with many new religions for financial support.